The English department believes that language and literature play pivotal roles in our personal and professional lives; that precision in speech and writing is dependent on ability, motivation and practice; that the refinement of verbal skills is a process closely aligned with maturity and growth; and that the reading of great literature inspires critical thinking, awakens imagination, and provides the foundation for language and writing skills. 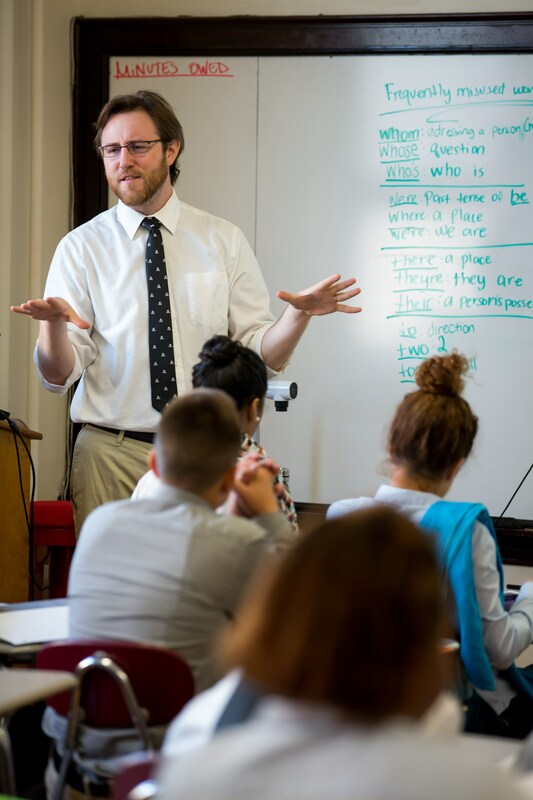 English I is an introductory course that prepares students for the demands of upper level, honors English courses at Cristo Rey Boston by giving them a strong foundation in the areas of writing, reading, and analysis. More than just helping students succeed in school, the purpose of the course is to develop their knowledge and skill with language so that they may better know themselves, participate in our democracy as an informed citizen, find challenging and rewarding work as adults, appreciate and contribute to our common culture, and pursue their own goals and interests as independent learners throughout their lives. How does reading and writing help me better understand myself and the world I live in? This course helps students advance their critical reading and writing skills through the study of various genres of literature and styles of writing. The course focuses on the impact of the individual on society and society’s impact on the individual. Students learn to identify connections between texts in order to compare the purpose and message of the authors’ works, and they use those comparisons to articulate and support their own arguments. Students also develop more sophisticated writing skills and learn to compose an original thesis and support it with innovative evidence that conveys critical thinking. Students do this through writing workshops that emphasize the stages of drafting required to produce polished work. In this interdisciplinary course students learn about the progression of American literature from the time of the Puritan colonists to the 20th century while also studying the people, events, and ideas that have shaped American history. Students analyze literary and rhetorical devices in works of fiction and nonfiction and craft persuasive essays that integrate original interpretations and textual evidence. Students also learn to be historians by interpreting primary sources, analyzing different points of view, following themes of American history, and defending their conclusions. Throughout the year, students learn to be critical and analytical readers, writers, and thinkers while studying some of the major literary and historical figures who have shaped the idea of the American dream. These senior English courses critically examine themes relevant to modern society through close reading of nonfiction texts and analysis of visual images. Thematically, the courses focus on education, the power of language, popular culture, journalism, and community while equipping students with the tools of rhetoric and composition. Students cultivate critical reading and thinking skills to grasp the meaning, purpose, and structure of both fiction and nonfiction texts. For example, students read essays from James Baldwin and Sherman Alexie, Pygmalion, Nickel and Dimed: On (Not) Getting by in America, and Things Fall Apart. While informal writing is woven throughout the courses, students learn to write in a variety of formal styles, including persuasive argument, rhetorical analysis, and synthesis. Independent work, including a major research project about the role of media in society, is a key ingredient to student success in these courses. Additionally, the AP English Language and Composition course requires students to constantly read, write, revise, and discuss in order to prepare them for the rigorous demands of college.